On this beautiful Monday morning we had another one of our spectacular cage diving trips to Seal Island in False Bay. The weather conditions were absolutely pristine! Calm Seas, no wind or swell whatsoever. 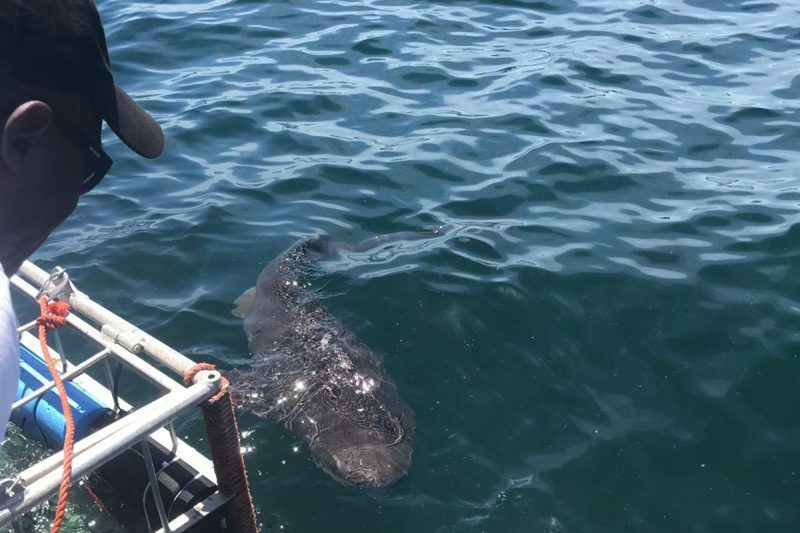 We have been interacting and witnessing the Prehistoric Seven Gill Sharks there for the last couple months whilst we have been out of our Great White Shark Season. Even though these Seven Gill Sharks are not the Top of the Shark Species list, they are incredibly special in their own way! Their normal living environments are in deep offshore waters around the world, ranging in depths, anything from 100 metres to 600 metres below the surface. We are extremely fortunate that we get to witness them in the shallow waters of 10metres right here in Cape Town False Bay on these trips. There are only two places in the whole world that you can actually see these incredible sharks in a safe tourism environment and that’s in San Diego California and of course right here with us in South Africa, Cape Town. This morning’s trip we managed to attract 8 individual Seven Gills to the boat for cage diving and boat viewing. We use methods to attract them to the surface to optimal interactions. We had every single one of our guests hop into the cage today, and all had massive smiling faces when they got out! The water temperature was a comfortable 16degrees Celsius, we have amazing 7mm wetsuits that keep you super warm. However we had the two girls decide to brave the water without any wetsuits on, as they were feeling a little seasick and needed refreshment. They thoroughly enjoyed the cage dive and were in the water as long as the boys. Such brave and awesome girl power! To top our trip off, we were accompanied on the travel by a gorgeous pod of around 300 Common Dolphins. They gave us a beautiful acrobatic show. Don’t miss an opportunity of a lifetime to see real living dinosaurs of the ocean! Join us on an Epic Prehistoric Seven Gill Shark Dive at Seal Island in False Bay today. Contact us to make a booking now to avoid disappointment!